Ray and I both have jobs in town and live on a small acreage in the Goodhue, MN area. Goodhue is located 50 miles southeast of Minneapolis/St. Paul and one hour from the Minneapolis International Airport. We have had full size Aussies for many years and have admired their versitility, intelligence and loyalty to the family. Ray and I saw these same traits in the Toy Aussies. I have always wanted a Mini Aussie until heard about the Toy Aussie, I told Ray that I am going to have one of those some day. We found out about a 2 year old Show quality Toy female (Zena) that was for sale. I showed Ray a picture of MR. PICKLE herding sheep and we decided to have her bred to him which was a good cross as Zena has a daughter out of Mr. Pickle (Sweet Pickle) that won 4 Best In Show Bred By Exhibitor and Best In Show Rare Breed. Zena is a proven producer as we have several other offspring from her that have won other Championships also. We think a Toy Aussie should have the same Aussies traits as the Standards: consiting of Atheltic Ability, Intelligence, and Herding Instinct. We also raise and compete with Registered Quarter Horses bred for cutting and understand how important conformation and instinct is in an athlete. We look for the same atheltic instincts in our Toy Aussies; they nned the right amount of bone and correct conformation in order to have the ability to be athlete. WOULD YOU RIDE A DRAFT HORSE INTO THE CUTTING PEN!!! NO- as they do not have the athletic ability due to their conformation. The same is true for an athletic Toy Aussie. 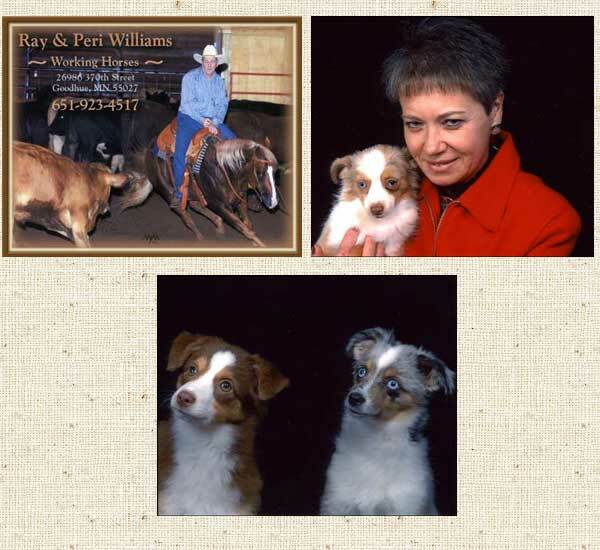 We are always happy to visit with people about our Toy Aussies or the Cutting Horses.